British mystery spy thriller, The Saint premiered on the ITV on 4th October 1962. 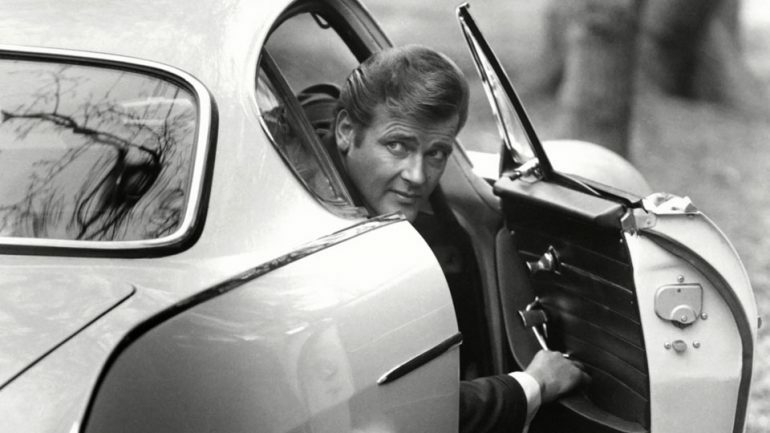 Starring Sir Roger Moore as the main character Simon Templar, The Saint aired for six series – a total of 118 episodes. 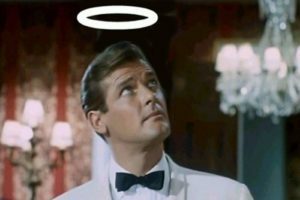 Simon Templar was a wealthy, Robin Hood-like criminal who always left a calling card at his crimes – a stick figure of a man with a halo over his head. The double episode entitled The Fiction Makers from season six, saw the charming character acting as a bodyguard for a best-selling adventure author. They both end up imprisoned at Sword Headquarters – filmed on location at Grim’s Dyke! The Fiction Makers double episode was used as a promotional film around Europe, intended to generate interest in The Saint TV series. In these episodes, after being mistaken for the best-selling author, Simon Templar and the real author – a female writing under a pen-name (played expertly by Sylvia Sims), escape from their prison, by removing roof tiles and descending a drain pipe. There’s speculation that Moore did most of his stunts himself and, as he lived close to Grim’s Dyke, he probably even walked to work on those filming days! The Fiction Makers aired in the UK on 8th December 1968. As per the other episodes, each had a runtime of 50 minutes. The first four seasons were filmed in black and white, whilst seasons 5 and 6 were colour. Not only was it popular in the UK, it also was aired in primetime slots in the US and eventually, in 60 other countries. Total profits from this popular TV series were in excess of £350m and, it proved to be one of the most productive uk-produced shows of its genre – beaten only be The Avengers, a British espionage TV series starring Patrick Macnee, Honor Blackman and Emma Peel. The original Simon Templar/The Saint character was created by author Leslie Charteris in the 1920s, for her series of The Saint novels and short stories. There were approximately 50 The Saint books and two Omnibus books in total, spanning a period of 1928 to 1963, with Enter the Tiger being Charteris’s third novel and the first novel in The Saint series. After this date other authors collaborated with Charteris on The Saint – with an additional two works being produced without Charteris’s participation in 1997. Interestingly, Sir Roger Moore had tried to previously buy the production rights to The Saint books himself. He eventually became co-owner of the show with Robert S Baker, when the show moved to colour production. During filming of The Saint, Moore was at least twice offered a great lead role in a series of films, but he turned it down, due to his television commitments. That role – that of James Bond – a role he finally accepted, after The Saint ended its run!